Despite public perceptions to the contrary, timber buildings can be designed to be very safe in fires and other emergencies. Designing for fire safety must enable people to escape in the early stages of a fire, and provide fire resistance to prevent a fire spreading and the building collapsing. For best results, this guide should be read in conjunction with AS 1720.4 and WoodSolutions guide 17, Alternative Solution Fire Compliance. Information about these sytems can be found on the Design for Fire page. 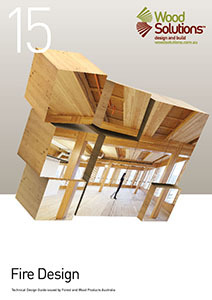 This Guide provides a summary of fire safety design process for a number of EXPAN-developed systems, including timber concrete composite (TCC) floors, timber cassette floors and post-tensioned timber beams without any fire-rated lining or additional protection. Design for structural stability in fire conditions is covered, as well as worked examples of the fire safety design procedures for each system.